Havana, Feb 3 (Prensa Latina) The Institute of tzropical Medicine ”Pedro Kourí” (IPK), in western Havana, announced the holding of the 14th International Course on Dengue Fever, which will be in session on Aug. 10-21. The epidemiological situation of the illness in the world and the region, clinical treatment, vector control, progress in research, pathogenesis, vaccines, development of antivirals, genetics of the individuals, influence of climate change, are among issues to be discussed during the meeting. New initiatives and their impact will also be presented, and other courses will be developed on parallel: one on mathematical model to forecast engue fever and the impact of interventions, and another about vaccinology of dengue, according to the Infomed website. The source says the course has a theoretical section and a practical section, including masterly lectures, round tables and symposiums. Participants will also be able to present their results in a poster session. 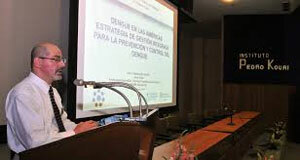 The event is sponsored by the Cuban Society of Microbiology and Parasitology, the Health Ministry, the Panamerican Health Organization (PAHO), the World Health Organization (WHO), the Regional Dengue Program (PAHO) and the Program of Neglected Tropical Diseases (WHO), among other organizations.